I ma eyeing to be the CS can you please tell me the procedure to become the one I will be thank full to you? The career of the CS or the Company Secretary is the very lucrative one and one can get the handsome pay as well by completing this course. The minimum eligibility to gain entry in the Foundation Course is a pass in 10+2 examination or its equivalent in any stream. 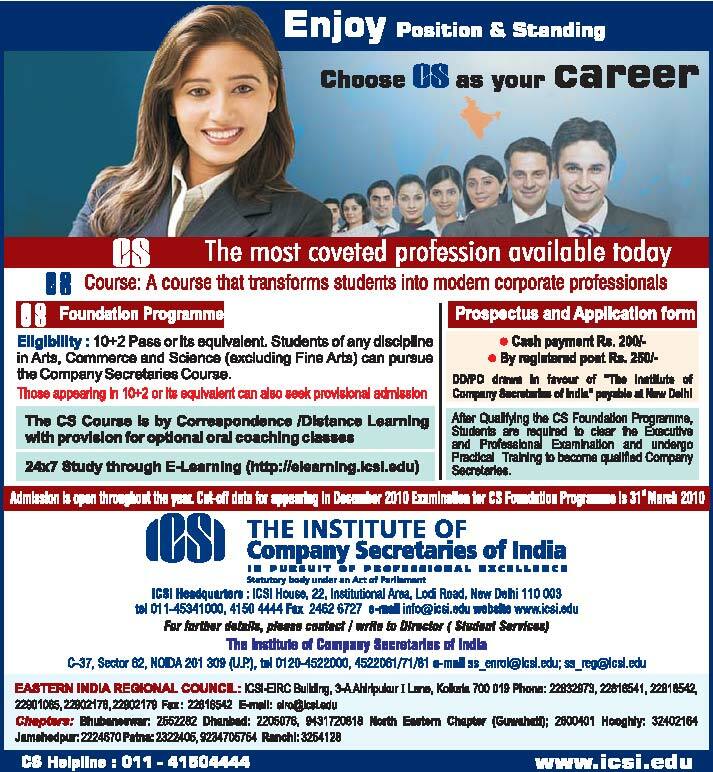 You have to pass in the Foundation Course Examination of the ICSI Graduation degree or a Master's degree/Pass in ICWAI, ICAI can allow you entry in the intermediate course of the CS. Once you pass the Intermediate Course you automatically become eligible for admission to the Final Course. One passing the Final examination of ICSI you will need to undergo a practical training after which, you will be completely eligible to get the Associate Membership of the Institute. The Training is of Training Orientation Program(TOP) is for 5 days and is done before commencement of training. This is followed by training for 15 months after the candidate has passed the Intermediate Examination or Final Examination. The main institute is ICSI(Institute of Company Secretaries of India) at the city of the Delhi and has the branches at Kolkata, Chennai and Mumbai.